At the juncture of the Mill Pond and the Schroon River, a creaking metal bridge fords a waterfall where, on a mid-summer’s night, red, yellow, blue and green spotlights glimmer on the water. A billboard advertises, “Horicon Day,” featuring water slides for the children, cotton candy and a fireworks display. In the fall, a sign strung across the waterfall announces the “Great Duck Race,” a highly competitive race of plastic ducks in the Mill Pond with betting that sometimes reaches triple figures, $1.00. These are the signs of the contemporary Adirondack hamlet of Brant Lake but, off to one side, a green metal marker, burnished by time, attests to Brant Lake in the 19th century and chronicles a moment in history when a grist mill, operated by Jud Barton and his sons, shared local commerce with a hotel, a hat shop and a blacksmith shop. The mill, built in 1865, ground corn, on which the town depended. 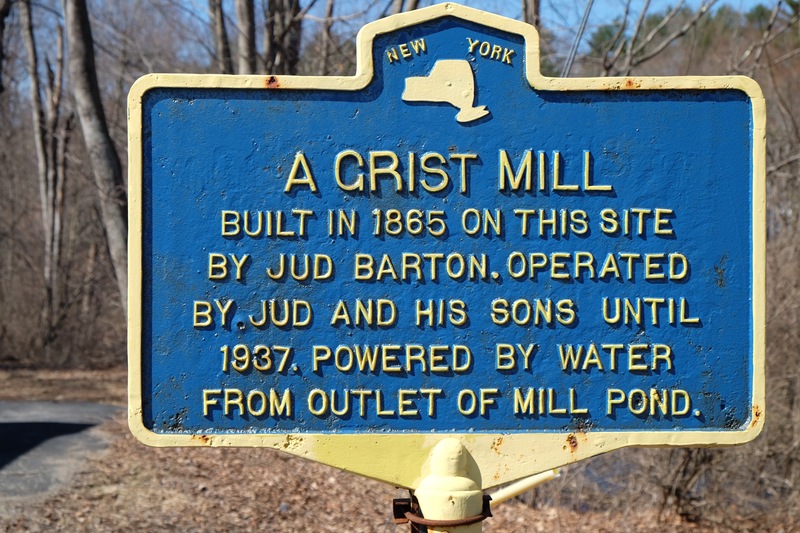 Few people visiting Brant Lake pause to read the grist mill marker. Today, A red Ford pickup, with a rifle mounted on the back window, careens around the curve where the outlet from the Mill Pond supplied water power to the mill. A Subaru with rust peeling from the rear bumper, and a KIA, make their way along the road without even a cursory glimpse off to the side. For that matter, how many people still speak of Jud Barton and an era when horse-drawn wooden carts, brimming with grain, unloaded their produce, to be ground by the force of stones turning at 120 RPM and powered by paddle gates churning water. And those who do recite tales of Jud Barton often fail to mention one of his more exotic enterprises, (if my account is accurate.) In addition to his job at the grist mill, Jud Barton claimed another profession. Jud was the town dentist. After a hearty breakfast of flapjacks doused in maple syrup, Jud would gather the tools of his trade, a bottle of Jack Daniels whiskey and a pair of pliers, then saddle his horse for a visit to one of the white clapboard houses on Tannery Road. Jud’s patient was waiting. Perhaps he was seated in a chair stuffed with fir branches but this much is certain, he was suffering from an infected tooth. Jud would take care of the problem. However, before operating, Jud gave his patient, or perhaps more appropriately his victim, a mug filled with Jack Daniels. This was the 19th century novacaine. Gradually the patient would relax, sufficiently intoxicated, and open his mouth. Inserting the pliers, Jud pulled on the sore tooth—and the rest is history. Mission accomplished, Jud returned to the grist mill. For people like me, who tremble when entering a dentist’s office, the image of those pliers creates a horrible specter. On the other hand, the thought of Jack Daniels, (although I prefer scotch, Johnny Walker Black), may be a splendid way to spend a morning. In retrospect, Jack Daniels and the pliers symbolize life. One gives us pleasure, the other pain. Of course, isn’t that what life is about, the mixture of pleasure and pain? For those who don’t drink, I would hope that simply being alive is sufficient. And I will drink to that. April 23, 2017 in Brant Lake.